Feel tired when you have been working for a long time? Have a chronic diseases like mouse hand, vertebrae ache and nearsightedness? Our Uarter computer armrest will give you a perfect answer. 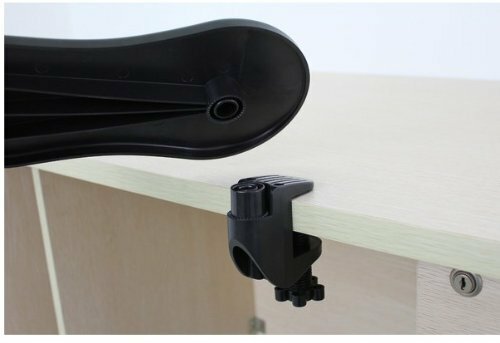 Our Uarter armrest can be easily installed within seconds, which is equipped with 180° rotatable ball joint. Our Uarter computer armrest is ergonomically designed to minimize the wrist and shoulder strain, so play and work comfortably for hours! MATERIAL- Made of durable ABS & Plastic, padded memory foam tightly attaches to the surface, minimizes wrist and shoulder strain. ERGONOMIC DESIGN- Fully adjustable 180° ball joint is adaptable for left or right hand users, effectively contribute to promote the blood circulation. EASY TO INSTALL- No assembly needed! It can be easily rotated out of the way and be carried in a briefcase or computer bag. WIDELY USED- Suitable for desktop up to 2'' (5cm) thick, convenient for home or office use.Play and work comfortably for hours. HELPFUL- The computer armrest reduces localized pressure on wrist and eliminates the constant strain on muscles in the neck, arms and shoulders. If you have any questions about this product by Uarter, contact us by completing and submitting the form below. If you are looking for a specif part number, please include it with your message.